Embark on a creative journey with acclaimed glass artist Michael Dupille. You will discover his latest techniques using frit in dynamic new ways. He covers various processes in thorough, easy to understand language and video demonstrations. 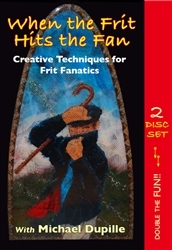 This 2 disc DVD program covers 3 different projects: Working with Organic Shapes - Scratch ‘N’ Frit - Frit Sticks, Fritzels and Other Parts. Also included: Simple casting using dams - Complete with Firing Schedules - and other Tech Tips! Michael Dupille is a pioneer and innovator in the kiln formed glass industry. He is credited with many of the working methods and processes considered as standards in the warm glass field today.